Hot Wheels is a brand of die cast toy car, introduced by American toymaker Mattel in 1968. It was the primary competitor of Johnny Lightning and Matchbox until 1996, when Mattel acquired rights to the Matchbox brand from Tyco. The original, and now famous, Hot Wheels logo was designed by California artist Rick Irons, who at that time worked for Mattel. 1968 - The first sixteen Hot Wheels cars were introduced into the market. They featured redline tires, spectraflame paint, a metal collector button, and some had roofs painted black to look like vinyl. The public saw the Hot Wheels Custom Corvette first before the actual car was introduced by GM. 1969 - Twenty four new cars were released, one of which was the Volkswagen Beach Bomb with rear mounted surf boards. Today this car is worth over $3,500 MINT. 1970 - This was the first year the Snake and Mongoose cars were produced. Mattel's first promotional cars were made for Jack in the Box. HW Saturday morning television show aired. The first collector's club w/ club kit (book, patch, membership certificate and either a Boss Hoss, Heavy Chevy or King 'Kuda in chrome). 2 more series were introduced - Spoilers & Heavyweights. 1971 - Mattel buys Monogram, the model-kit company, and employs one of their designers for new concept HW cars. 1972 - Mattel dropped the metal buttons from the blisters. 1973 - Inflation caused Mattel to cut costs. This year's cars would only be issued for one year due to poor quality. Spectraflame paint was discontinued and they began to use enamel paint. The first Oil company promos were issued for Shell. 1974 - The "Flying Colors" series was introduced. This was Mattel's first issue of tampos. 1975 - The first Motorcycles were produced then dropped until the '97 FE Scorchin' Scooter. 1977 - This was the last year Mattel would use the redline tire. 1979 - The Heroes and Scene Machines were introduced. 1980 - The Hi-Rakers (rear axles could be raised or lowered to increase the rake of the car) & Workhorses series were introduced. 1981 - The Hot Ones - "fastest non-powered metal cars" were introduced. The first collector's handbook was issued. 1982 - This was the first time Hot Wheels were issued at Mc Donald's. Mattel moved the production plant to Malaysia. 1983 - The 15th Anniversary of Hot Wheels. Real Riders were introduced and became a very popular series. Cars were now being made in Mexico, sold to it's domestic market, and France, sold to the European market ONLY! 1984 - Ultra Hot wheels were introduced as the fastest Hot Wheels ever made. 1985 - The first cereal cars were offered by Kellogg's. 1986 - Two more series were introduced - Speed Demons and Flip-Outs This was also the end of the Real Riders series until 1995. 1987 - The first price guide was issued. Also, the first collector's convention was held in Toledo, OH. 1988 - The 20th anniversary of Hot Wheels. Special gold and silver chrome cars were produced for the occasion. 1989 - Park-n-Plates were introduced - special cars in plastic "garages". 1990 - California Customs were produced this year, along with a line of cars based on "The Simpsons" television show. The first Aircraft (Helicopter) was issued. 1991 - The first "Gold Medal Speed" cars were produced w/ gold Ultra Hot wheels. Mattel produced their one billionth car and released special gold plated Corvettes on display stands. The first McDonald's Happy Meal offered either Hot Wheels or Barbie. 1992 - The Pro Circuit and Tattoo Machines were introduced. 1993 - The 25th anniversary of Hot Wheels. A line of exclusive Toys R Us cars were produced with redline tires - The 25th Anniversary Series. The Revealers were released. 1994 - The Vintage Collection (continuation of the 25th Anniversary cars) were released. The HW logo was introduced as a tampo on ALL cars. 1995 - The introduction of the Treasure Hunt Series, limited to 10,000 of each car. The most desirable of the 12 cars produced is the white '67 Camaro bring a premium price of over $300. Mattel also began to issue 1 car (Model Series) and a 4 car series per month. Real Riders were also re-introduced as a 4 car series (the most expensive series with a value of over $100. Six new wheel variations were issued - Sp3 (3 spoke), Sp5 (5 spoke), Sp6 (6 spoke), Sp7 (7 spoke), HH (hot hubs), & POW (progressive oval wheels). 1996- Mattel changed the Model Series to 1st Editions, which are the first run casting of each of the 12 cars. The VW Bus was issued this year and continues to be a favorite among collectors. The Corgi casting (European) started to appear. Three more wheel variations - Dw3 or sb (directional or saw blade), Lw or wsp (lace or wire spoke wheels), Ho5 or 5dot (5 hole) & Ho5w or 5hw (white 5 hole). 1997 - Pro Racing cars were introduced and made a favorable splash with collectors. 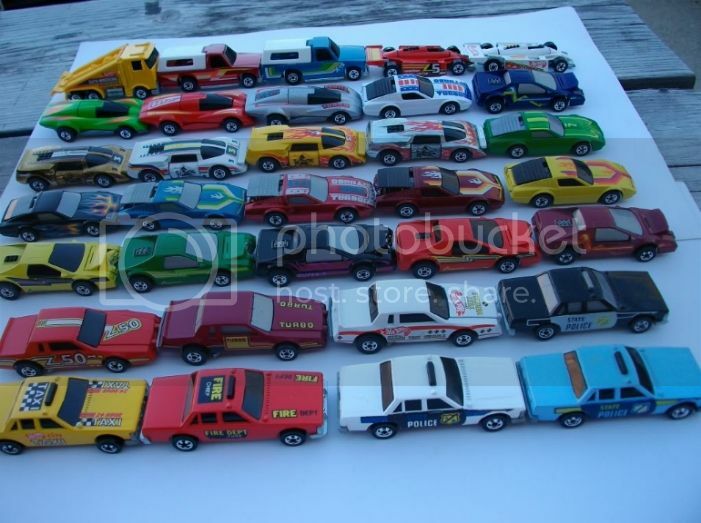 1998 - The 30th anniversary of Hot Wheels, a line of commemorative cars (1 from each year) were issued. 40 First Editions were also produced, with many error cards printed as 45 or 48. 1999 - The first Pro Racing Treasure Hunts (LE to 15,000) were introduced. A new 12 car series for retiring models, "FINAL RUN" are released. 26 First Editions were also produced. 2000 - A New Wave of Store Brand Exclusive Releases hit the shelves. KB Toys Cop Rods, Target Editors Choice, plus a Large Selection of Exclusive 2-Packs from other chain stores. A new wheel style is added to the line called pr5. A special series called the "Virtual Collection" is added into the main line releases. Real Rider Tires are brought back for most of the Treasure Hunt Line. A New Style Card is Released with many Models on both style cards. 36 First Editions were also produced. 2001 - TRU has the Exclusive on a Second "Final Run" Series. In-Store Exclusives still going full blast with the Series 2 Cop Rods, Fire Rods, Editors Choice & even Wal-Mart joins in with the Auto Milestone Series. The 2-Packs are also still being released in large droves. The first Hauler & Pavement Pounder Treasure Hunts were introduced. The Black Box Cool Collectibles gets a new Box packaging and is now being called 100% Hot Wheels. 36 First Editions were also produced again. 2002 - Big changes with 42 First Editions and 15 4-Car Series in the line-up. 2 more New Style Wheels are released. What's it worth? Take a look at this Hot Wheels price guide: sold listings for a value indication. ►reply: I found on eBay right now, for 10 USD: hot wheels 1981 military. ►reply: Hi there, I am not with the company so your best bet would be to contact Hot Wheels or to find Hot Wheels Crack Up here. I have a hotwheels 1982 members club included are 2 comic books, stickers, a patch, and a poster showing all the howheels for 1982. Have any Idea of value?